Our exit planning solution for business owners is based on a Seven Step Exit Planning Process™, which is illustrated and described below. Depending on your level of prior planning, you may need to address all or just a few of the components of the process. Step 1 – What are the Business Owner’s Objectives? Determine the desired outcome of transferring your business, including desired departure date, value needed from the business, the individuals or entities to whom you want to transfer the business, and the impact on others such as family, employees, and the community. Step 2 – What is the Value of your Business and Personal Finances? Identify the current value of your business, projected cash flow and other non-business assets and income. Step 3 – How can I Maximize and Protect my Business’ Value? Identify the elements that give your business value, called value drivers, and focus on protecting and maximizing them. Step 4 – How do I Transfer Ownership to a Third Party? Depending on who you wish to sell to, you will go through the process associated with either step four or five. If you wish to transfer your business to a third party, we identify and implement the strategies and techniques that result in the most beneficial sales price and terms. 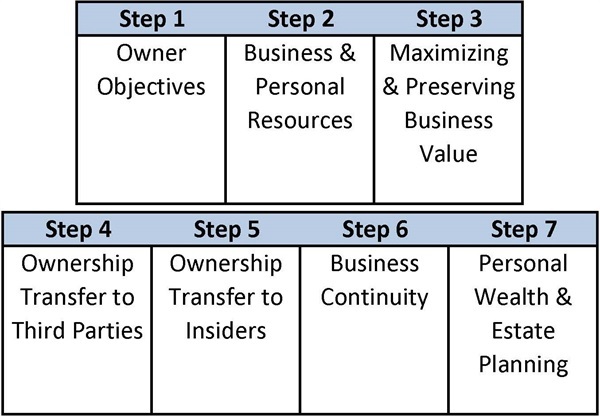 Step 5 – How do I Transfer Ownership to Insiders? A transfer to family members, key employees or co-owners—those who may have little or no personal capital—while extracting the desired value and minimizing risk can be tricky. We can show you how! Step 6 – How do I Establish a Business Continuity Plan? Prepare for contingencies, such as the death or permanent disability of an owner, to minimize the negative impact of such events on the business, the business owner’s family and co-owners, if any. Step 7 – How do I Preserve my Personal Wealth and Estate? Create a plan to utilize your newly created capital, preserving wealth and minimizing taxes using both lifetime and estate planning tools.